You guys know that I love an Instagram Beauty Secret reveal. Today I stumbled upon a post that is pure gold. Who doesn't love a good transformation pic? This one is so inspiring that I had to share it with y'all. Luckily for us, she shared the exact routine that caused such a dramatic change in her skin. Best of all, it's only 3 steps and all of the items are readily accessable no matter your budget. Instagram user Shylajanai posted this image and was bombarded with likes and comments. Her caption laid out the details of what products created her perfectly flawless skin. first I wash my face with the 100% pure black soap every morning and every night (don't know the brand but I get it at Mid k), then at night I tone my face with the Thayers witch hazel and put on the eucerin face lotion and spray the rosewater by Mario Badescu. I only use the rosewater in the morning if I'm wearing make up that day, I'll soak my beauty blender with it. Also let's address a few things: I know I have big eyes, I get it from my daddy. No I'm not lying, I don't have any reason to because although I had bad skin my confidence was never touched, I'm honestly just tryna help my sisters out. I'm not high, The sun was in my eyes because I was facing it dead on, I'm sure y'all have heard of squinting. I have combination skin sometimes it's dry sometimes it's oily. And nah that ain't my hair. Did you notice how she mentions that she soaks her beauty blender in rose water before applying makeup? I thought that was brilliant. Whenever I use a makeup sponge to apply foundation, the product seems to go deeper into the skin, providing a more flawless finish. Imagine applying a blend of rose water and your favorite foundation at once. I suspect that it'll add a bit more luster to the finished look. This may be a something to try during the dry fall and winter months. This is the second time I've featured someone with flawless skin who attributed all they had to African black soap. Seems like black soap can be life changing if your skin responds well to it. I've already reintroduced black soap back into my routine because I keep hearing so many great reviews. Now let's talk about the obvious. This woman was able to overcome active acne AND somehow eliminate all of the discoloration associated with it. I'm sure you're wondering how. I was too. Based on some of her responses in the comments, Lajanai didn't really take any deliberate action to create even toned skin. She sorta attributes it to the black soap but wasn't quite sure if black soap was the true hero. We know from the other article that pure (raw) black soap has the ability to address acne, exfoliate, and even out skin tone. Some say the long-term effects of black soap is like having microdermabrasion done. This soap is an actual dream come true. Keep in mind that Lajanai's transformation took about a year so the fading was probably a gradual process. But through it all, she remained consistent and was rewarded because of it. Kinda.... maybe it's not at CVS (yet) but I think it's pretty easy to access rose water at a health food store or even an ethnic grocery store. At the very least, it can be found on Amazon for under $10.00 (travel size). The small size is $7 at Ulta.... that's definitely drugstore pricing and location. Interesting! I think my issue is that I never use a toner. my skin has been looking better since Ive been drinking the bamboo tea and taking a a multivitamin +more water. but I really want to perfect my routine for the summer before I have to start thinking of winter maintenance! Yay for bamboo tea!!! I find it easier to make a difference in the fall/winter because I'm not dealing with sweating, excess oil production, clogged pores, etc. A toner really helps bring balance to the skin after cleansing. There are a bunch to choose from depending on your skin's needs. african black soap is bae! either raw or mixed for certain skin problems only problem i have is clearing my dark marks will add witchhazel and rosewater now! Yay, I have all three of these items so I'm going to start tonight. Purchased all three products and began using as suggested. The black soap has irritated my skin. I think it's too abrasive, causing my skin to burn. I have to bypass the with hazel and just apply the rosewater, following up with vitamin e oil to alleviate the burning. Maybe I should try another brand of black soap. Any suggestions? You can substitute black soap with something a bit more gentle. Or perhaps a cleanser the contains black soap in the ingredients instead of pure (raw) black soap. 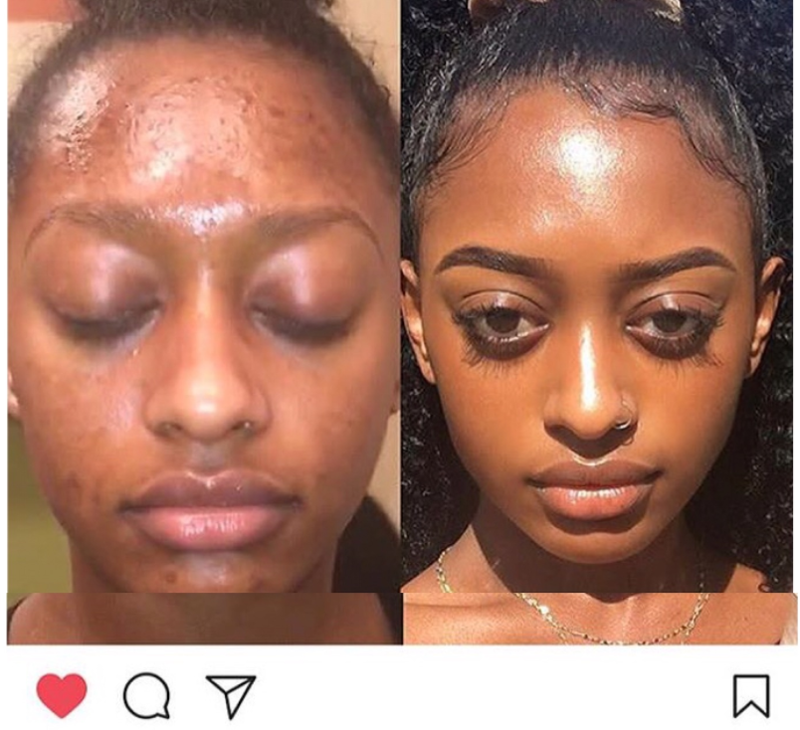 I think the black soap helped with her discoloration so if you have scarring, you probably should add an acid based toner or vitamin C serum.